Mascot Mania!!! Winter 2010 Edition!!! It is no secret that I am in favor of well-designed Olympic mascots, even though I have no interest in sports. Mascot design = character design, and that’s definitely something I’m interested in. From bottom left to top right, we have Mukmuk the marmot, Quatchi the sasquatch, Sumi the animal spirit (orca headdress, thunderbird wings, bear legs), and Miga the sea bear (part orca, part kermode bear). Yeah, I’m pretty sure Sumi and Miga are FUZORS in disguise. Note to self: start drawing picture of Sumi and Miga as Fuzors. 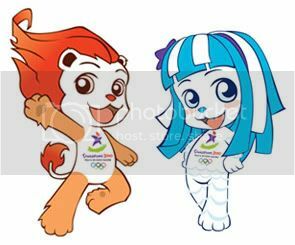 Their names are Lyo and Merly, and they’re the mascots for the first ever 2010 Summer Youth Olympics (taking place in Singapore). Lyo is a lion cub, and Merly is a merlion cub–ANOTHER FUZOR!!! Don’t be surprised if I end up drawing these two when the Youth Games roll around. BONUS: Official Page for Team Australia’s mascot, BK the boxing kangaroo! CAUTION: The following post is uncharacteristically robust with content. If you’re just here for discussion of awesome mascots, skip down a bit. The next paragraph is gonna be me yammering on about my process. Several of my cronies have been requesting that I draw more involved pieces, with multiple characters, backgrounds, and, I dunno, cohesive lighting or something. The simplicity of the Fuwa made them ideal for a more complex piece–I got to concentrate on composition and color, rather than obsess over costume details. The composition here is the right idea, but the execution is lacking. All in all, I can live with it, because the entire production of this piece was spontaneous, and for me, pretty fast–the whole thing took me about five and a half hours. 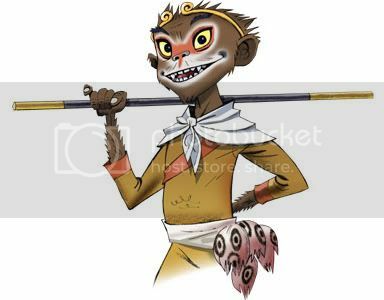 Monkey, AKA Sun Wukong the Monkey King, is easily my favorite literary character of all time (sorry Batman and Naruto, it was a close race! ), so you can imagine that I’d be pretty stoked. But on top of that, who do you suppose provided the art and sound for BBC’s incarnation of Monkey? None other than Jamie Hewlett and Damon Albarn, best know for collaborating on Gorillaz. Check out the main page with an amazing animated trailer here, featuring Monkey and his pals using Olympic skillz to vanquish demons. See more pics of Monkey, Pigsy, and Sandy here. For a little background, read this article. And download masks of Monkey, Pigsy, and Sandy here! 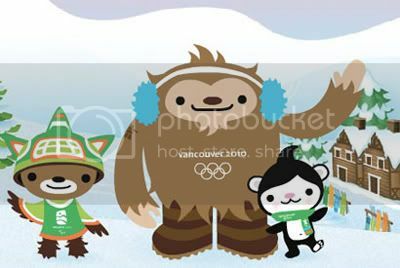 ON TOP OF EVERYTHING ELSE, I have also stumbled upon the disarmingly charming mascots for the 2010 Winter Olympics in Vancouver–Quatchi (a sasquatch), Miga (AN ORCA/BEAR HYBRID!!! 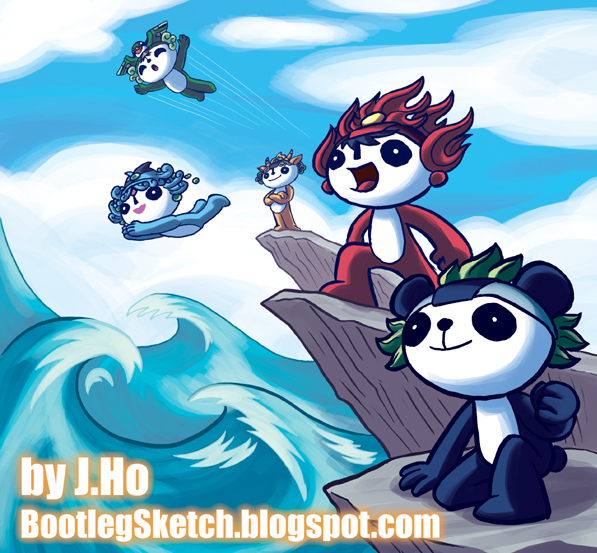 ), and Sumi (a magical animal spirit somewhat resembling an anthropomorphized totem pole). 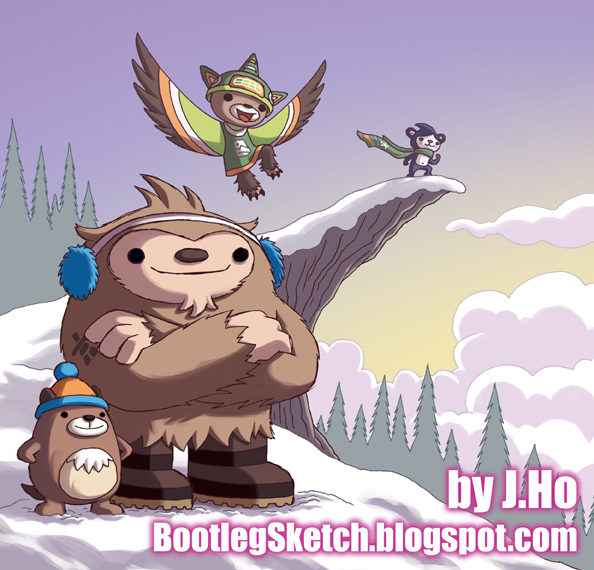 Check out the main page for the 2010 Winter Game mascots here. Be sure to watch their slick animated video intro here. We live in a golden age of Mascots.